Fans were startled by the story of Miami's quarterback, Jack "Mighty Mouse" Hackett. The brilliant little ballhandler of the Hurricane team was once paralyzed from head to foot with polio. Normal one day, paralyzed with polio the next. That in short is the Hackett story. What did he think? How did he feel? Only Jack Hackett knows. All the fans know is that through a tremendous amount of willpower and determination he pulled through. Jack was born in McKeesport, Pa. He grew up there and entered McKeesport High School, where he amazed local football prognosticators by showing a remarkable type of field generalship and power that people didn't believe a runt like Hackett could possess. The little fellow proved taht in order to run a championshiphigh school team, a man did not have to be a 200 pound giant. Hackett held down the first string high school quarterback post for four years. Then polio struck, but the little-giant overcame it in time to enter the University of Miami. He sparked the freshman team, then in his sophomore year he led the varsity. Fans who watched the Hurricanes warm up in pre-game practice often turned to one another and asked, "Who is that little guy out there, a team mascot ?" They found out different as soon as the Canes tok over the ball. But it was still difficult for the fans to believe it. The little "mouse" out there, one foot two inches shorter than the other from the polio, leading a Miami team to top national ranking. 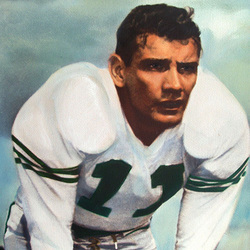 Hackett was the starting quarterback at Miami from 1949 through 1951. He led the Canes history making 20-14 upset of the Number One ranked Purdue Boilermakers in 1950, as Miami went 9-1-1, its only blemishes a 13-13 tie with # 9 Louisville and a 15-14 loss to Clemson in the Orange Bowl Classic. Miami and Hackett would get revenge in 1951, a 14-0 victory over the Tigers in the 1951 Gator Bowl to finish out an 8-3 campaign.